Make the most of your visit to San Diego by signing up for valuable hotel email offers. Save money and receive information about leading tourist attractions and destinations, such as Balboa Park and Coronado Island. 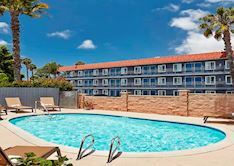 As an added bonus, when you join our rewarding email family, you'll be automatically entered to win a free night's stay at the Red Roof Inn Pacific Beach/SeaWorld San Diego! Check your email regularly! Every month, we'll be highlighting special offers that feature well-appointed guestrooms, complimentary deluxe continental breakfast, and free Wi-Fi. In addition, tell us about your travel interests so we can provide deals tailored to our customers.